Students who major in computer engineering will work to create faster, more useful and more efficient computer systems and instruments for use in a global environment. Through courses that use a hands-on, project-based curriculum approach; nine fully equipped, modern laboratories; and industry-sponsored fieldwork, you'll develop the engineering and research skills in top demand by high-technology industries. Your classes and projects will ramp up the physics, chemistry and mathematics work you did in high school to a level that will let you create software and hardware valued by a broad spectrum of industries. Expertise among the diverse faculty covers major specialty areas of electrical engineering and offers a global approach to engineering issues. Opportunity for students to be involved in industry-sponsored projects and faculty research. Laboratories that support study in digital signal and image processing, computer simulation and CAD, electromagnetics, communication systems, control systems, circuits and analog electronics, digital electronics and embedded computer systems, integrated circuit design, power systems and electric machinery. Active student organizations that are branches of national and international organizations provide professional engagement and social interaction opportunities. Computer engineering graduates nationwide earned an average starting salary of $69,480 in 2016, according to the National Association of of College and Employers Salary Survey. 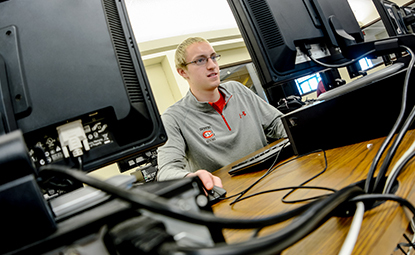 Two-semester capstone design project that spotlights each student's area of excellence. Projects range from industry-sponsored work on industrial sensors, medical equipment research, robotics and green energy. Up to $18,200 available for two years in National Science Foundation STEM scholarships. Department scholarships offered to those in their last two years of study, including one for nontraditional students.